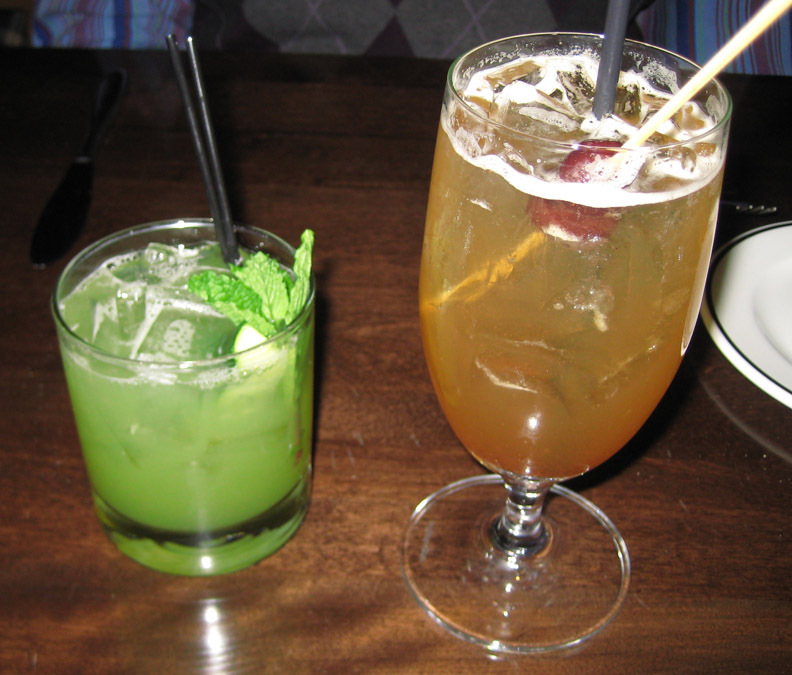 First we started off with a couple of new cocktails, the pretty green Morning Dew (gin, elderflower liqueur, cucumber) and the Hobo's bourbon and cola, with Bulleit bourbon and house-made cola. Gin always reminds me of my first hangover, so I tend to avoid it; happily, the spirit is undetectable in this cocktail, which was bright and refreshing and reminded me (in a good way) of pickles. The cola in the other drink--strongly vanilla and sweet-spice-flavored (cinnamon, nutmeg, etc.) --meshed nicely with and did not eclipse the bourbon. 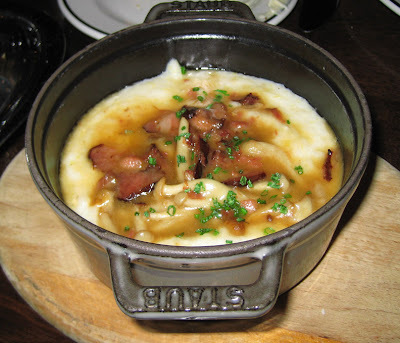 Both paired well with the food, being light enough not to mask any flavors, while retaining a degree of assertiveness. We also enjoyed the Annabella pinot noir that our (fantastic) waiter later paired with our entree courses. 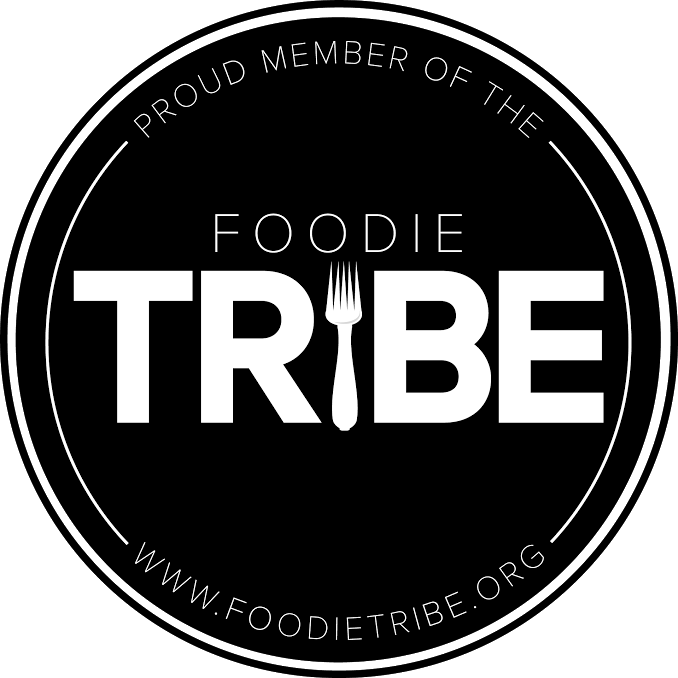 Chef Dunklin is a proponent of small plates and has added an extensive selection to the menu, as well as new charcuterie and raw bar items. 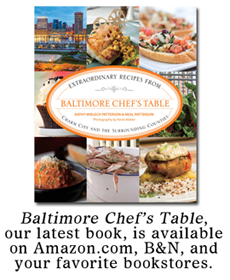 The chef also hails from New Orleans, and a not-so-subtle Southern influence is noticeable on the menu. Among our favorite dishes of the evening was the Brick Oven Roasted Prawns with ginger bbq, green onion sausage, chive biscuits. 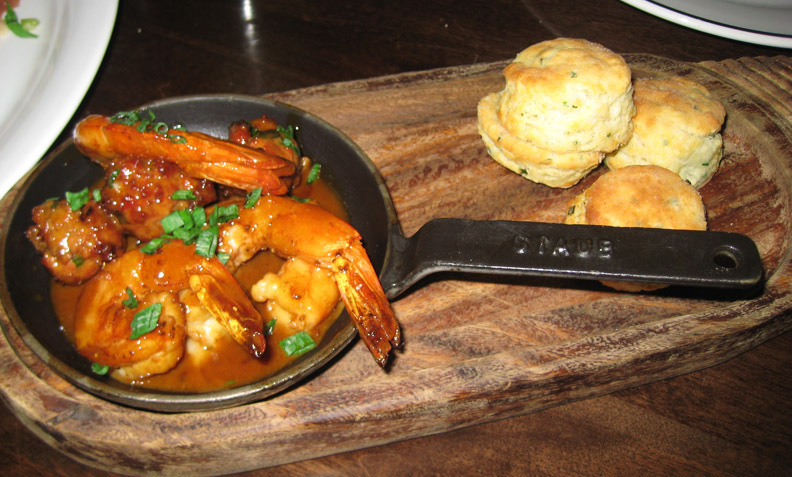 A riff on New Orleans-style bbq shrimp, with a Worcestershire-and-stock-based sauce rather than the sweet molasses-y sauce that usually comes to mind, these little babies were full of roasty flavor, and the buttery biscuits were little bites of heaven on the side. ...for example, the Slow Roasted Pork Belly, which was prepared like bacon and had a nice smoky flavor with tender meat and melty fat. 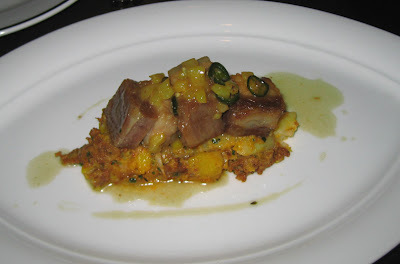 It was accompanied by a hash of saffron potato, pearl onion, chorizo, and a serrano chili glaze. While the glaze itself wasn't particularly fiery, watch out for those slices of serrano chile - they may be wafer thin, but those babies are hot! 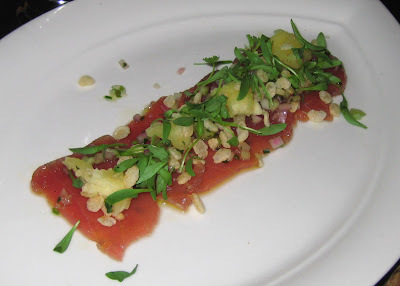 We also enjoyed the Ahi Tuna Crudo, which was a symphony of textures--soft tuna, crisp rice, and a citrus sponge, which had a scrambled-egg-like texture but tasted of grapefruit/orange/lemon. And put micro-cilantro on anything and I'm happy. 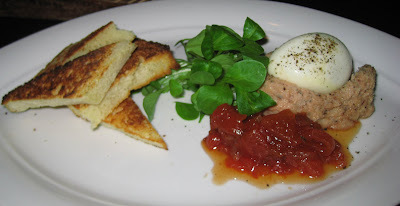 Both the Double-Smoked Bacon Rillettes with slow poached egg, tomato jam, and cornmeal brioche and the Venison Mortadella with pecorino waffle, watercress, and pinot noir reduction came from the brand new charcuterie section of the menu. Chef Dunklin's rillettes are a smoky paste of bacon--a decadent breakfast-for-dinner snack when spread with some poached egg and lightly sweet jam on triangles of toasted brioche. 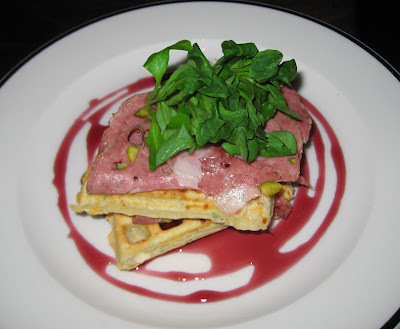 The mortadella--beautifully studded with bright green pistachios along with the usual white cubes of fat--rested atop wedges of savory waffle, which when dredged through the sweet sauce could best be described as "weirdly delicious." 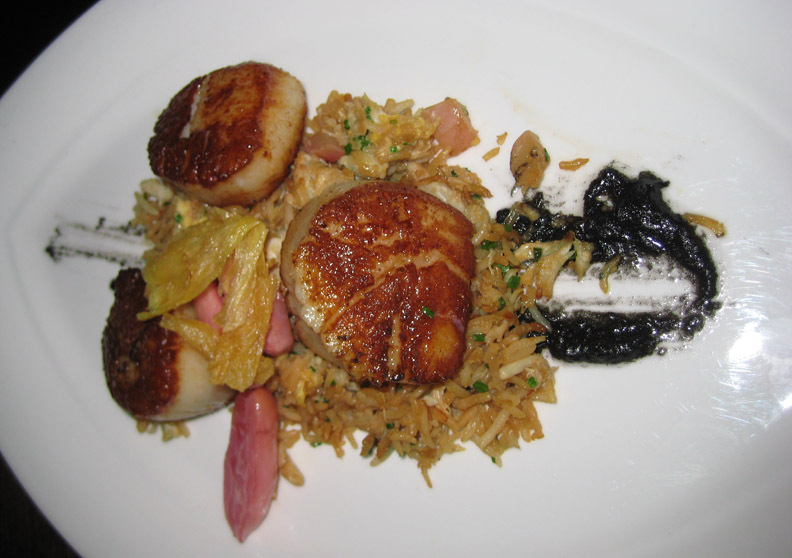 I'm a sucker for scallops, and the Diver Sea Scallops with crab fried rice did not let me down. The scallops--beautifully cooked, still somewhat translucent inside and meltingly tender--came on a bed of fried rice garnished with cooked radish, a caramelized onion oil enriched with squid ink, and bits of crispy ginger that lent a dramatic spicy sweetness. 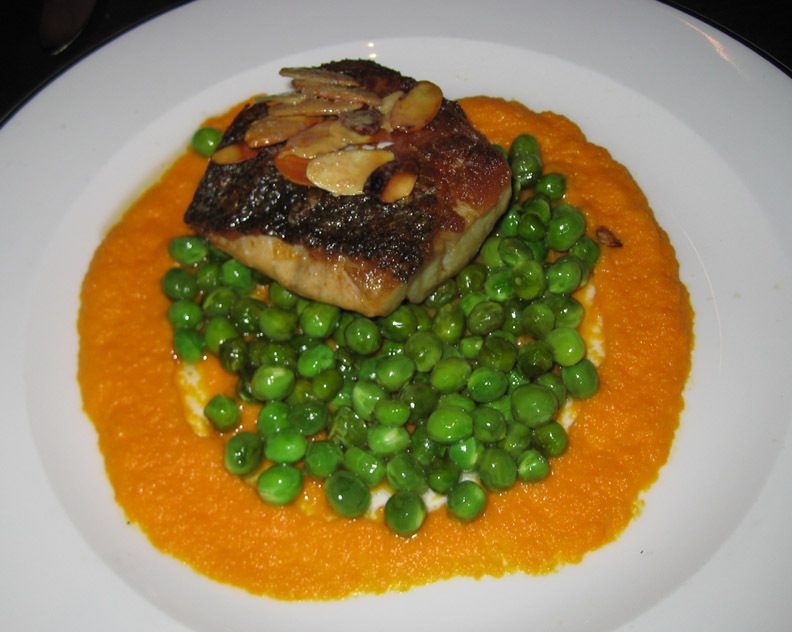 The Maryland Rockfish had a great sear and crisped skin and was very Spring-like served on a bed of carrot puree and fresh green peas. My favorite component of the dish, however, was the sliced almonds on top. They were seriously, unexpectedly, smoky, and lent a smoky flavor to anything they may have touched on their way to the plate, including random mouthfuls of carrot and peas. 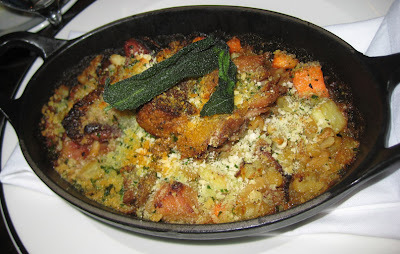 The Duck Cassoulet was chock-full of goodies: corned breast, confit leg, and spicy duck chorizo in a pile of flageolet beans mixed with chunks of carrot, potato, and parsnip. While I normally consider cassoulet a cold-weather dish, this version is delicious enough to eat at any time of year. Finally, we received two desserts to sample, one of which was the Red Velvet Donuts drizzled with cream cheese frosting, accompanied by a sweet potato cashew milkshake, a play on coffee and donuts. The "donuts" were more akin to a cookie with crisp outsides and tender insides, and the milkshake reminded me a bit of taro-flavored bubble tea. The second dessert was billed as a Banana Bread Pudding, but it seemed more like a British-style steamed pudding flavored with banana than a bread pudding. 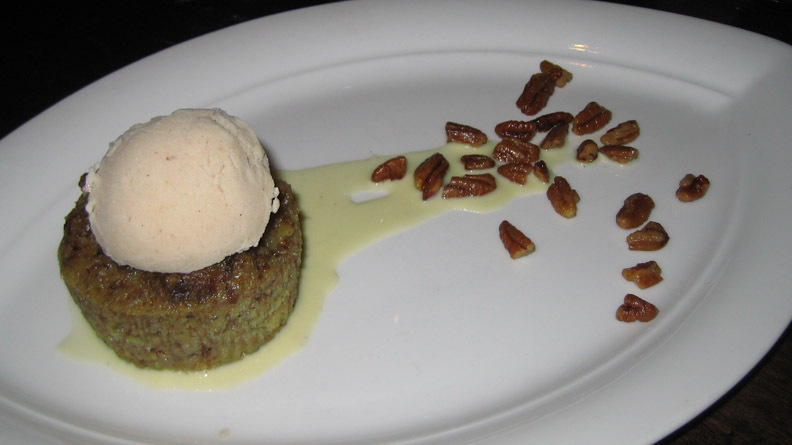 In any case, it was served warm with candied pecan ice cream and toasted pecans. I dare say we got enough of a sampling of the menu to be able to recommend it highly. 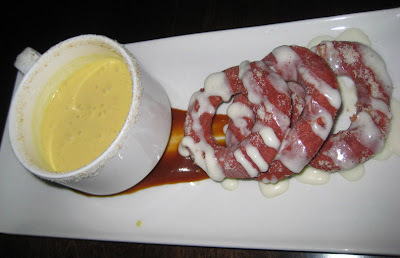 :) Personally, I'm interested in going back and trying more of the small plates, charcuterie, and raw bar items. I'm sure they won't let me down.